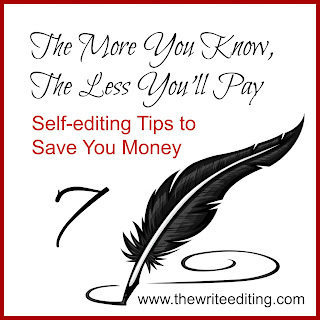 As authors, we're always looking for ways to save money and time. This is the seventh post in a series that is meant to help you save both. On the front end, putting forth the effort to learn these points will cost you some time, but in the long run, it will save you money on professional edits. Last week, we went over creating an accurate timeline. This week, we'll take a look at transitions. There are four reasons for a break in your story. These are chapter breaks (when you start a new chapter), a change of scene, gap in time, and a change in point of view. When creating a chapter break, you would start a new page with the word "chapter" and the number at the top of the page (or seven double spaces/14 single spaces down the page, if the publisher prefers it). You will want to be sure your previous chapter ends with something that will cause the reader to turn the page, and you will want to be sure your new chapter starts with a hook that will keep the reader reading. They are centered on the page and consist of one to three webdings, such as an asterisk or a pound sign (also now known as a hashtag). You would do the same for a change in POV, switching from one character to another. This hard break lets the publishing house editor know that there is a change happening. Once the novel goes to print, there may be a blank line space between these changes. Your hard break marks will tell them where to put those line breaks. Some publishers leave the hash tags in place. 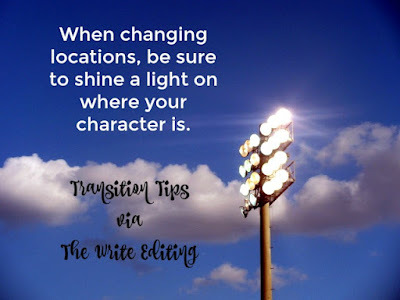 When changing from scene to scene, be aware that your reader needs to know the new location. 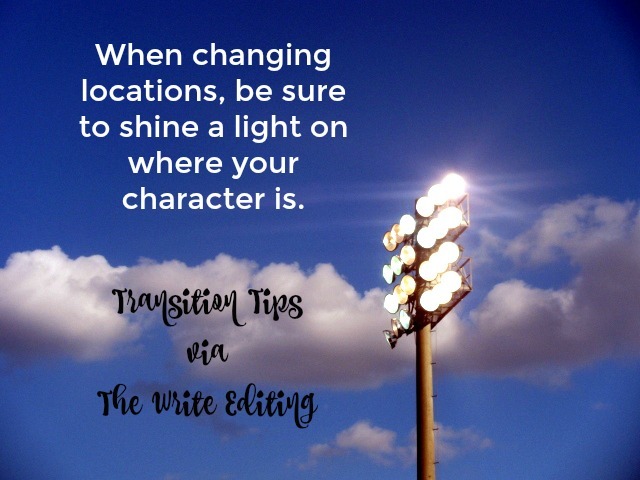 It's best to introduce a place by putting the character within it and letting the reader experience that place through the character's eyes. Don't just start a new scene with a conversation or the character's action. Show us through his or her five senses where we are. What do they see? What do they hear? Smell? Can they taste something, such as when in a restaurant? How about touch? Is the bedding soft and they don't want to crawl out in the morning? You may need to name the location, such as "He pulled into the hospital ER parking lot and almost forgot to put the car in park before dashing through the doors." When changing point of view, we need to know which character we're reading. Don't forget to name them at the start of the change. Otherwise, your reader will be trying to figure out who he or she is. Now let's talk about another kind of transition. What is the proper way to transition from paragraph to paragraph? When a character is doing something or talking, don't switch paragraphs until they are finished. When another character acts or speaks, they need a new paragraph. Even if it's just one, two-word sentence. I often see authors write a paragraph of one character's actions and conversation, and they'll insert one sentence of another character's dialogue in the middle of the paragraph. Don't be lazy about hitting the enter/return key. Each character needs their space. What questions do you have about transitions? Feel free to leave them in the comments. We'd be happy to respond! Thanks Alycia. This post was very helpful. I like that you told how many spaces down to start the chapter. I had wondered if there was set format for those kinds of things.